Buckeye Valley’s Morgan Scowden soars toward the hoop during the first half of Friday’s MOAC showdown against visiting North Union. 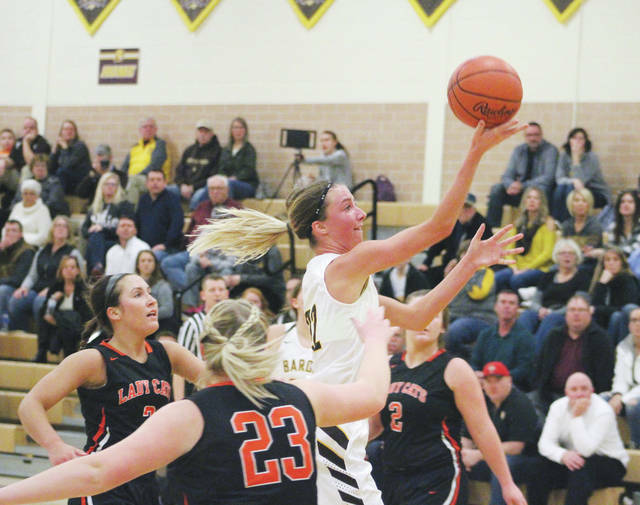 In a game that resembled tires spinning in the mud, the Buckeye Valley girls basketball team got off to an 8-0 start and never trailed in a 56-49 win over North Union in MOAC action Friday night in Delaware. Tess Hughes scored six points to lead the opening rally and Scowden paced the Barons (11-6, 6-4) the rest of the way with 16 points. Hughes finished with 12 points and Dani Grether scored 10 and pulled down eight rebounds off the bench for BV, which swept the season series. The Wildcats stayed close, pulling within three aided by a Taylor Day and-one and two Maddi Ruhl three-pointers. But, the Barons pushed the lead back thanks to a couple of Scowden baskets and a third from Grether to lead 25-18 at the break. The game slowed to a crawl in the second half as the teams combined for 27 fouls and 38 free throw attempts. The Wildcats got as close as three on a couple of occasions in the third, the first off of a Ruhl three-pointer. Scowden buried a three from the right corner through contact to push it to 40-33 to start a 7-2 rally and NU never got within striking distance again. “It was important that we were able to get that lead back,” Stout said. Hannah Cowan added a pair of free throws and Hughes knocked down a jumper during the spurt. Cowan finished with seven points and eight boards for BV. Ruhl led the Wildcats (12-7, 6-5) with 15 points on the strength of four threes and Avery Clark had 21 rebounds to go with 13 points. Next up, BV plays out of league for the final time of the regular season when it hosts Grandview Heights Tuesday at 7:30 p.m.